Moody Bible Institute and corporate evangelicalism. Some preachers serve as religious brand-names, standing in for entire movements. A North Carolina farm boy played that role in postwar evangelicalism. As Billy Graham was to late 20th-century America, so Dwight Lyman Moody was to the decades following the Civil War. Moody was the grandfather of both modern evangelicalism and global ecumenism, and his offspring continue to shape the trajectory of American Protestantism. What role did a 19th-century evangelist play in the making of 20th-century evangelicalism? How did a new religious movement rebrand itself as the "old-time religion"? These questions and more are addressed in Timothy E. W. Gloege's fine new book, Guaranteed Pure. Like George Marsden and Joel Carpenter before him, Gloege provides an owner's manual for contemporary evangelicals. 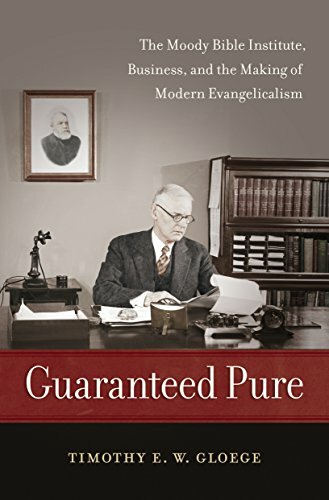 An intellectual genealogy for a forgetful people, Guaranteed Pure explores the creation of America's most influential religious movement. As a fourth-generation evangelical, I grew up hearing stories about my great-grandfather's visit to the Moody Church. Symbolizing a profound shift in religious orientation, his conversion marked a turning point in our family's history. Raised in the Norwegian Bible Belt, my great-grandfather was baptized into a world of Lutheran sacramentalism. This religion of font and altar was transplanted to Meeker County, Minnesota, by the same clergyman who started St. Olaf College. Devoted to the Nicene Creed and the Augsburg Confession, Meeker County's Lutherans were unimpeachable in their orthodoxy. Shaped by the dual inheritance of Lutheran confessionalism and Norwegian Pietism (especially the legacy of the revivalist Hans Nielsen Hauge), they followed a religion of both head and heart.